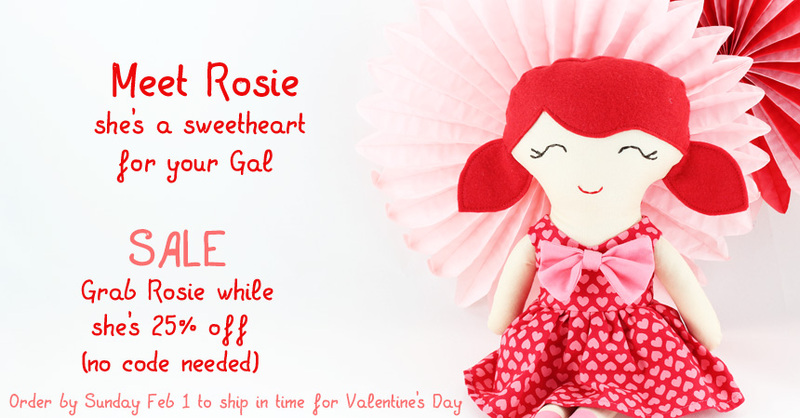 Rosie is wearing a charming red ruffled dress with a big pink bow. She’s a perfect pal for Valentine’s Day and every day. Rosie came about as a result of thinking to go wholesale. It may not be visible in the photos, but she has a markedly different construction than the other dolls. Her head, arms, and body are put together differently with a skin base so that I can change the doll by changing the clothes and not the entire doll. This was a little tricky to re-configure and took quite a bit of pattern changes.